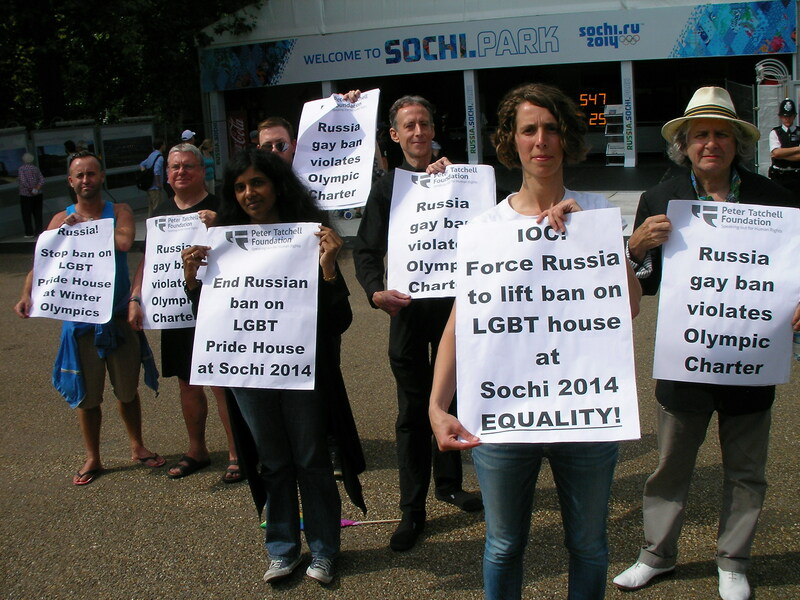 This appeal comes from protesters who picketed the Sochi 2014 Winter Olympics Exhibition in Kensington Gardens, London, today, Thursday 9 August. “London 2012 has a LGBT Pride House but Russia won’t allow one at Sochi. This ban is part of a wider crackdown on LGBT communities and visibility in Russia. It is an attack on freedom of expression and association, and coincides with new laws in several parts of Russia that ban so-called homosexual propaganda,” said Peter Tatchell, Director of the Peter Tatchell Foundation and coordinator of Thursday’s protest. “We have written to the IOC, urging them to intervene. Russia’s gay ban is contrary to the equality and non-discrimination provisions of the Olympic Charter. The IOC is duty-bound to require Russia to permit a LGBT Pride House,” he said. Other participants in the protest echoed Mr Tatchell’s concerns.